RUU 355 - Will it affect the non-Muslims? Ambiga then argues that being charged is different from being affected. PETALING JAYA: The proposed changes to Syariah Courts (Criminal Jurisdiction) Act 1965 (Act 355) or RUU 355 that seeks to enhance the Syariah Court punishment has brought about strong public reactions in the country. A public debate, hosted by NGO group, BEBAS on Friday night has gathered four lawyers to discuss the motion of RUU 355, if it should be made into law. The speakers; Aidil Khalid and Lukman Sheriff Alias are those in favor for the motion while Datuk Ambiga Sreenevasan and Haris Ibrahim were against the motion. Lukman, who first took the floor, introduced and explained the RUU 355. "In short, RUU 355 is a short law to amend the existing law. The law that existed 33 years ago. It seeks to increase the limit of sentencing of existing offenses," said Lukman. He believes, a fair argument on this issue should be about the 'limits' of the punishment because it is subjective. Ambiga, however thinks the RUU 355 is too focused on punishment, without defining the offences under the RUU 355. "The offence must be clearly defined and this RUU does not define any offence. "I believe there are problems with RUU 355. Even if you say it's constitutional, there are other problems. I personally think it must be looked again. "The best way to protect everyone is to state it in the legislation, if you state it clearly in the legislation, then you assuage the fears,"said Ambiga. RUU 355 AND NON MUSLIMS? Other issues highlighted in the debate is also on how the amendments will or will not impact the non-Muslims in the country. According to the Constitution, Ninth Schedule, State List stipulates that the Syariah court is to have jurisdiction only over persons professing the religion of Islam. "For the last 60 years, how many non Muslims have been convicted or prosecuted for not fasting during Ramadan, or not going to Friday prayers? None. "None, and it will not be applied to non Muslims in the future as well because of the constitutional safeguards," said Lukman. "If you look at the conversion cases that have taken place. When it plays out it does impinge, and those cases goes unsolved for many many years. "How about the ISA, the promises that it will not be abused, what happens? 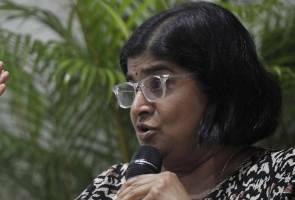 It happened," said Ambiga. Ambiga, acknowledging that the RUU 355 does not involve punishment such as stoning or death sentence, believes it still involves other hudud laws. "In my view, this does cover hudud offenses. Hudud is covered by this amendments. It wouldn't have been covered before, but is covered now. "So for that reason, I would argue it goes against the basic structure of our federal constitution, and therefore, unconstitutional," said Ambiga. Lukman however said, RUU 355 does not introduce hudud, because of the constitutional restrictions. "The RUU 355, to say it introduces a new hudud law, it cannot be because we have constitutional restrictions. "Hudud has been around for decades. Malaysian Muslims are already used to the syariah laws. The proposal to amend this act has been listed at this term's Dewan Rakyat sitting. At the same time, Deputy Prime Minister, Datuk Seri Ahmad Zahid Hamidi has also confirmed that the Barisan Nasional government will table RUU 355. The bill seeks to amend the Act, also known as Act 355 or RUU355, to empower Islamic courts to enforce punishment, except for the death penalty, provided in Syariah laws for Islamic offences listed under state jurisdiction in the Federal Constitution. Hudud: Brunei laksana hukuman rejam sampai mati April ini?